Hundreds of students and civil society members attended the moot and paid rich tributes to the martyrs of “Students Movement 1953”. They also paid rich tribute to Dr. Mohammad Sarwar, who they said was the core catalyst for the formation of Students Unions for the first time in Pakistan. Gathering commemorated the martyred students and other people killed by police firing on 7th January 1953 during the peaceful rally entitled “Demands Day” organized by Inter Collegiate Body (ICB) and Democratic Students Federation (DSF). The High School Students Federation (HSSF) also actively participated in the movement, and some of those killed were high school students. Organizers at the event screened the documentary depicting the emergence and struggles of students of their 1953 movement. The 30-minute short documentary included the analytical viewpoints of those people who struggled in the movement. The movement started comprising the basic demands of students including revise fee structure (make fees payable monthly instead of six-monthly), improve laboratory, library and hostel facilities, build a proper university in Karachi and provide employment security to graduates. The High School Students Federation also actively participated in it. During the movement, students protested across Pakistan and catapulted DSF into a nationwide, broad based student movement, standing for student unity across all divides. Later this momentum led to the formation of All Pakistan Students Organization (APSO) in December 1953. However, within months DSF and all other progressive bodies were banned and their leadership arrested, following Pakistan ’s signing of the Baghdad military pact with America in February 1954. This was the cold war era and Pakistan was trying to align with USA, where the anti-communist Mccarthy movement was at its peak. Apart from it, student activists during the 1953 movement including Dr Haroon Ahmed, currently a Psychiatrist, Mirza. M. Kazim Ex- Vice Preisdent DJ College, Shahida Haroon Ex-President Democratic Students Federation (DSF) Govt College for Women, Mazhar Saeed Ex-General Secretary DSF, Saleem Asmi, Ex President DSF and Mazhar Jameel, Advocate Sindh High Court shed light on the movement at the gathering and briefly shared their views on the students rights movement. The intellectual depth of DSF activists could be measured from the fact that it produced dignitaries such as Dr Adib-ul-Hasan Rizvi, Dr Syed Haroon Ahmed, Dr. Jaffar Naqvi, Dr Khawaja Moin, Dr Ayub Mirza, Dr Sher Afzal Malick and Husain Naqi, and several other prominent intellectuals. Human rights activist I.A Rehman said in his brief speech that 1953 movement support all segments of the society. He said the students’ movement in 1950s was not only the movement of students, adding it was for civil society members for ensuring provision of rights to the people. He urged young generation to adhere to the values of historic people who sacrificed their lives for sake of their rights during 1950s. Students representatives from Karachi University, Quaid-e-Azam University Islamabad, Sindh University Jamshoro and Lahore University of Management Sciences (LUMS) also delivered brief speeches seeking revival of the students union. They were of the view that today’s youth are unaware of the real concept among unions, students organizations and students wings of political parties. “Students unions must be revived for student activism”, said Alia Amirali, student at Quaid-e-Azam University Islamabad. While continuing her speech, she said restoring students union would certainly not be problem free. However, the same principles applicable to democracy in the Pakistani context should also be applied to the students’ context, that is, the process must be allowed to take place without being derailed, controlled or manipulated. Student speakers stated that majority of students do not raise their voices against evil practices that are being imposed on them. They held education institutions responsible for not providing the right platform to raise their voices. Lastly, they urged all students to recall such sacrifices of students in 1953 movement to acquire freedom in their campuses and education institutions. Journalist and documentary filmmaker Beena Sarwar, while talking to PPI said that the purpose to organize such gathering is to provide historical information to youth so that they could enhance their spirit for raising their voices for their legal rights as done by the students of 1950s. She said student unions should be pressurized by authorities concerned against their malpractice for their personal benefits. She said students unions should work to solve problems of students instead of achieving their personal benefits. “I am hopeful that such large gathering of students here today would subsequently play their due role to attain their legal rights”. She said we must recall our historical event and incidents to get better results in our future. Responding to a question, she said it is not planned that such gathering would be arranged every year but efforts would be made to arrange such events to commemorate historical achievements by prominent intellectuals, she added. 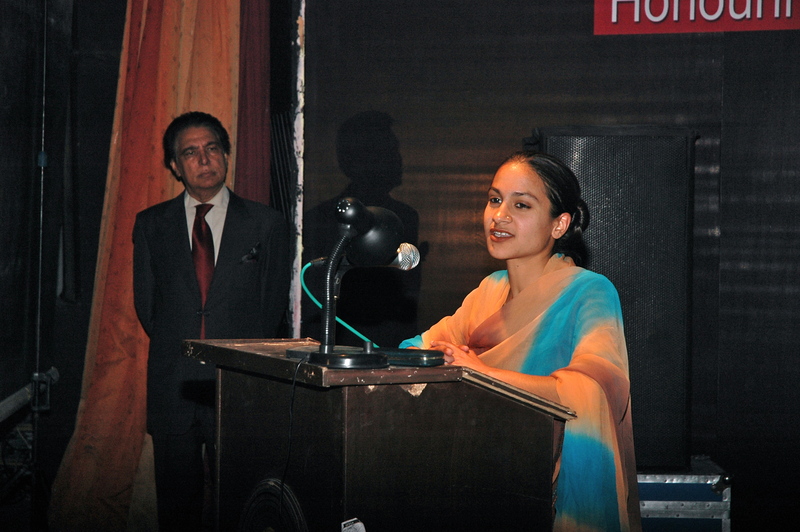 Fehmida Riaz and Tina Sani also recited poems on the occasion. Later, the event concluded with the musical performance of LAAL Band that created sensation among the participants.